Croatia has two climates, as you may well expect – one along the coastline, and one for the interior of the country. If you’re visiting, here’s what to expect for climate and weather in Croatia! The coast has a typically Mediterranean climate consisting of hot, dry, sunny weather during summer, and relatively mild – though somtimes wet – weather in winter. Average temperatures during summer should lie in the mid-to-high 20s °C/77-86°F, although it is more likely that you’ll have temperatures well into the 30s °C/high 80s or low 90s °F. Winters are obviously cooler, although temperatures never really get below about 5°C/41°F. Anything colder than this is considered freak weather, though technically not impossible – in the last ten or so years, there have been occasions of snow in parts of Dalmatia, such as Zadar and Split. In some winters, even Dubrovnik (one of the most southern points of Croatia) has seen a light dusting of snow. It is not usual for summer weather to stretch out into autumn with temperatures in the high teens or even low 20s (Celsius) – meaning some hardy souls still hit the beach and go swimming. In general, however, during autumn and winter on the coast, you will still experience some sunny days, although it can sometimes get quite rainy. 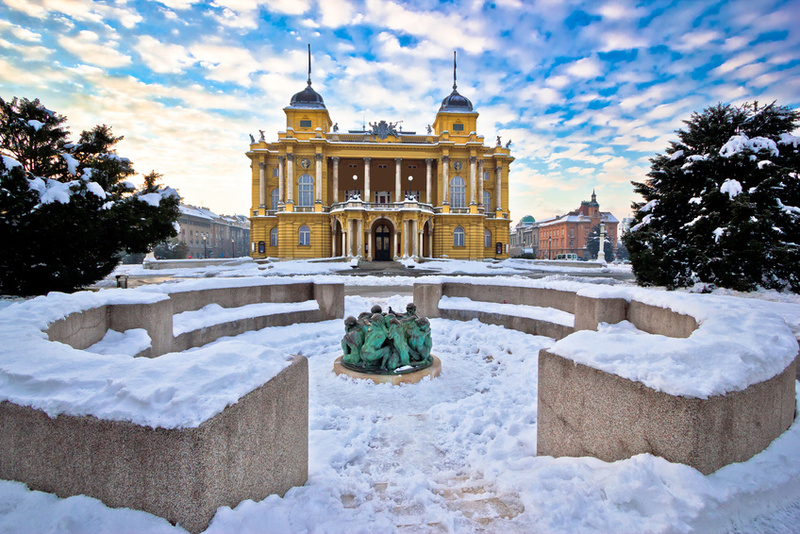 A continental climate exists in the interior of Croatia which means that winters can be pretty cold, with temperatures often falling below 0°C/32°F. Snow is very likely, and can be pretty heavy during the winter. Summers, on the other hand, can very often be sweltering with temperatures often reaching the mid to high 30s °C/high 80s or low 90s °F. When there’s no cool sea breeze (or the sea itself), it can get a little uncomfortable at times. Officially, average temperatures in the interior would be around the low 20s °C/low 70s °F but, from personal experience, it will be much hotter. Air-conditioning is reasonably common in Croatia these days. Wherever you are during summer, it is more than likely that your accommodation (hotel or private) will have it, providing you with a bit more comfort in summer. Air-con is also pretty common in cafes, restaurants and bars. Weather in Croatia – when should I go? If you thinking of the weather in terms of the best time to go to Croatia, we’d advise September…or possibly May. September still has glorious, sunny weather with warm temperatures, and the sea will also still be warm enough for swimming. May is also a great month to visit Croatia, as temperatures have already risen to a pleasant level and you’ll have more and more sunny days, but will be without any of sweltering heat that will make you want to lie down every half an hour. The sea may not quite be warm enough for swimming in in early May, however! Better still, you’ll avoid the peak season crowds if you go in one of these two months. One reasonably famous – or most likely, infamous – aspect of Croatian weather that you may have heard about, or even experienced yourself, is the ‘bura’. The bura is a very strong north-easterly wind that blows towards the coastline. Generally experienced in Dalmatia, and is felt strongest around the Velebit mountain range (near Zadar). It normally occurs in winter though some of its effects can be felt year round. The strong wind occurs due to the two different climate types clashing. This means the wind is considered unpredictable and strong gusts can happen rather suddenly. Wind speeds can reach over 125 miles/200 kilometres per hour, although you’re unlikely to ever come across winds that strong. Unsurprisingly, the bura causes disruption to those sailing off the coast and to ferries. However, problems to traffic on the roads and so on can also occur on land. You can find all sorts of weather and climate statistics at the excellent Croatian Meteorological Service website, which has plenty of information in English. Their most useful pages are the current weather in Croatia; the 7-day forecast; and the current sea temperatures.